The lamp shades were a part of this project I agonized over. In the end it was a fun engineering challenge. The first challenge was to figure out what color to make the shades. I printed out a few sample shades that I tested out with a simple rig on a breadboard that would run through a series of animations on a small NeoPixel stick from Adafruit. This allowed me to see how each of those sample shades would look as the colors on the strip changed. First I tried Village Plastics and PolyLite White PLA — it was not bad but seemed to look like a warmer color (See photo below) which while not bad was not the look I wanted. Next up I tried nGen clear filament — which prints a lot slower than PLA but also is more resistant to heat — and I really liked the results. The colors were clearly transmitted through that material and could be seen from the sides. For me this lamp is not really used for downlighting, it’s more of a novelty to been seen from all angles so I thought this was the best solution. NOTE: My friend and co-worker Chris also printed out test shades in PolyLite Translucent Red, Yellow and T-Glase Red — and much like my experiments seemed to skew the colors too much to look like whatever color the filament was. In the original LED Bridge Lamp (Universal Segment) by my friend Janis Jakaitis (Opossums) I noticed in one of the photos the LED strip was sagging a bit (See below). This is a common problem as the adhesive on the back of these LED strips is not all that good or strong and doesn’t stick well to plastic. If you go with a more aggressive glue it makes it harder to repair/move/replace anything that fails in the future. After working with my test rig I also found that these LEDs can cause glare and be rough on the eyes if you look directly at them so I figured some sort of diffuser would be a worthwhile addition. 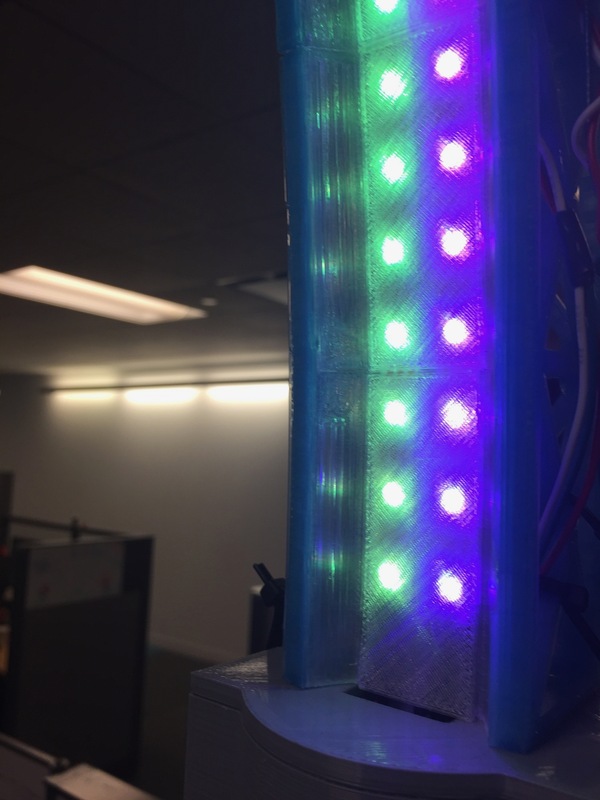 I spent some time trying to come up with an elegant solution — maybe printing each shade vertically and creating a channel for the LED strips — but I felt that orientation would weaken the shades and likely result in rougher prints. Other ideas were too complex — such as screwing on diffusers etc. I printed these light channels WITHOUT any sorts of brim as the object is flat with a lot of surface area and didn’t require any real cleanup. 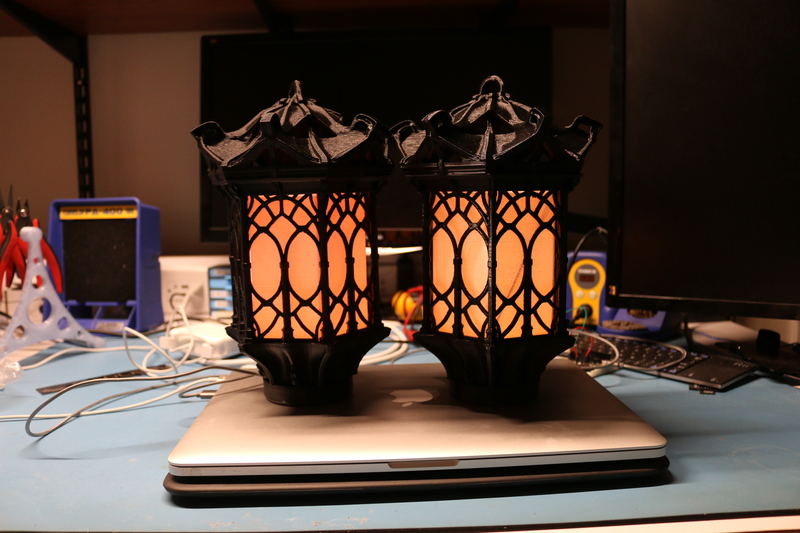 I printed my lamp shades with 20% infill. 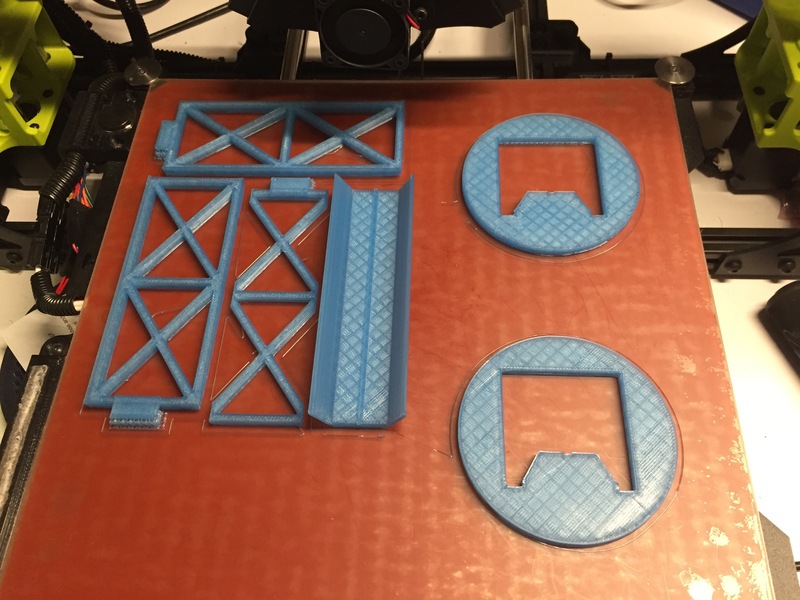 You’ll want to make sure your printer is really dialed in and well calibrated. If you find the diffuser cover is too tight, I provided a ‘loose’ cover LightChannelDiffuserCoverLoose.stl which is the same diffuser cover but 2% narrower. I believe this is what I used as the basis of the covers included in the curved shade sections — so those already include a loose diffuser cover. 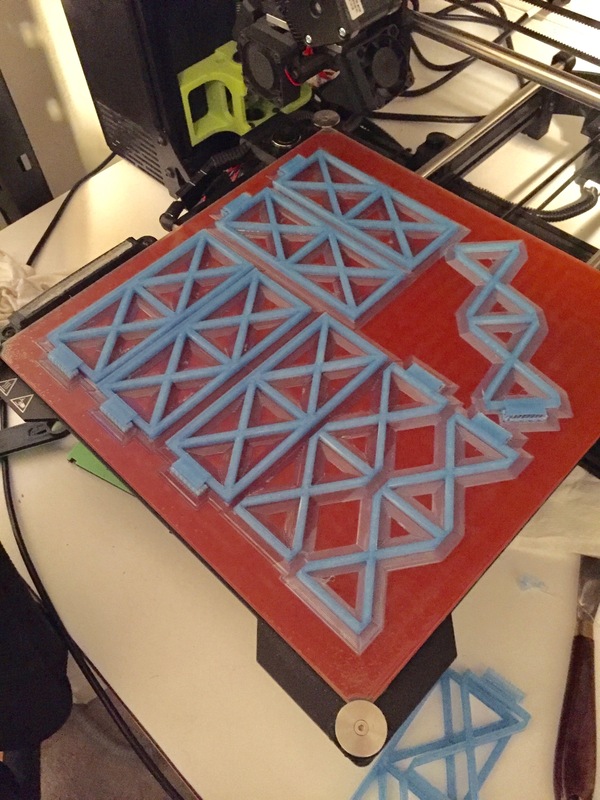 If after printing you find yours are still too tight you can break up any of the diffuser sets and scale the diffuser cover another percent or two narrower. When trying to slide the diffuser covers into the diffuser I found it was sometimes easier to slide in if I spread the diffuser a bit in my hands as I slid in the cover. 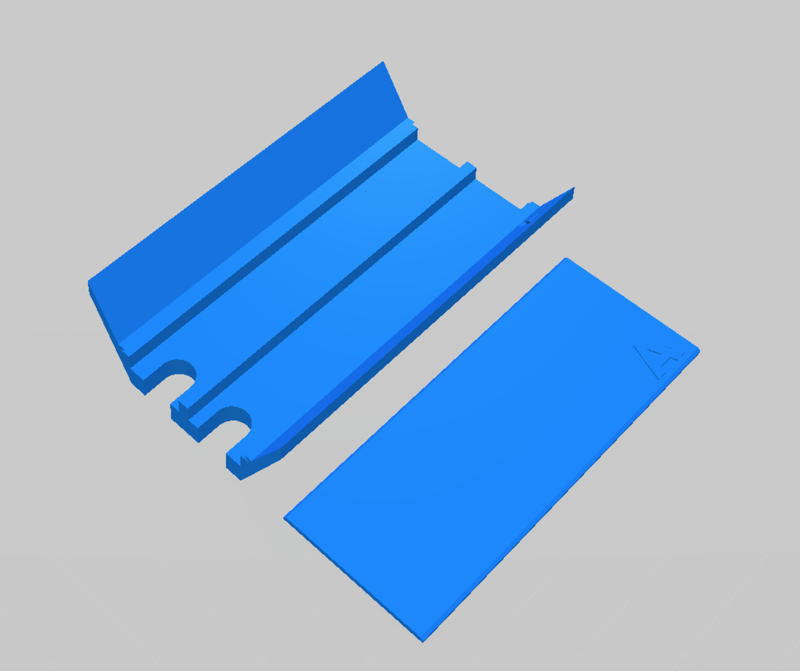 Make sure the diffuser cover is oriented the right way (the same way it was printed)– with the tapered side down before trying to insert it into the diffuser channel. For the curved sections of bridge lamp there are two sections — an ‘A’ and a ‘B’ section each with a diffuser channel and a cover. All parts print with a letter in/on them. The ‘A’ in the cover should be oriented the same as the ‘A’ in the diffuser channel. The same logic applies to the B section. Section A and B are not identical mirror images, just like the original channels. After removing the lamp shade prints from the printer I would assemble the lamp shade section (slide in the cover) and file the ends flat with a flat mill file. They didn’t need much filing but I wanted nice smooth mating surfaces. I would have an assembled super structure assembly in hand and could use that to test and make sure the ends were co-planer with the ends of the bridge superstructure section. I would assemble the 3 blue superstructure sections using the nice glue up jig provided by Janis’ original model. I didn’t bother to modify the jig to fit the lamp shade diffusers — as my shades have a deeper channel. Instead I would take the assembled (and dried) superstructure, line the edges with a small bead of LocTite 401 CA glue and then slide in the shade (Above the glue lip and then slide it down into place to not disturb the glue and more than needed. This allowed me to squish/twist the superstructure if needed to really square up the now fully assembled section. You’ll want to take extra care to make sure the channels of one section really line up well with the next one. For curved sections I’d glue the A and B sections to each other (make sure to file and test fit that A and B mate cleanly). With an assembled A and B section I’d then follow the process described in the paragraph above to glue it into a completed curved superstructure assembly. In the image above you can see how the A and B sections are mated in a curved section of the completed bridge lamp. 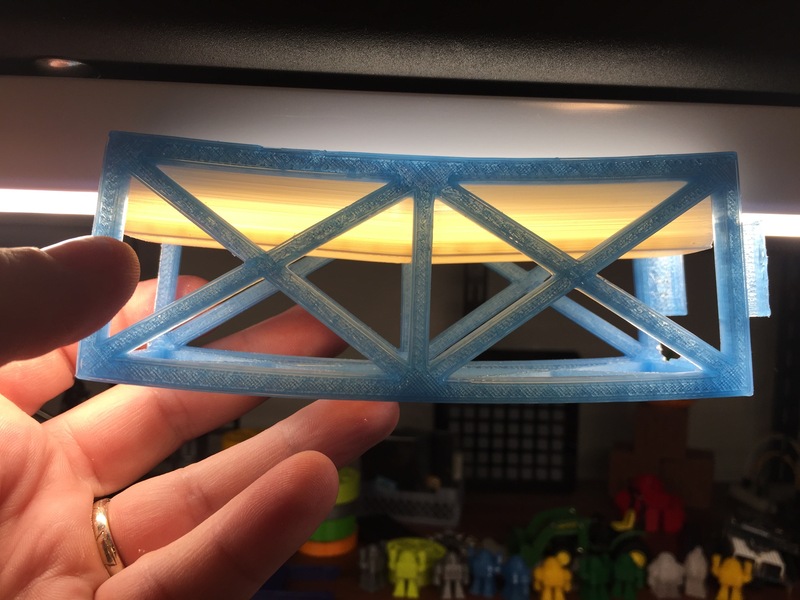 My bridge lamp is broken up into 3 assembled sections — 90 degrees of the arc, 2 straight sections to support the billboard and another 90s degrees of arc. 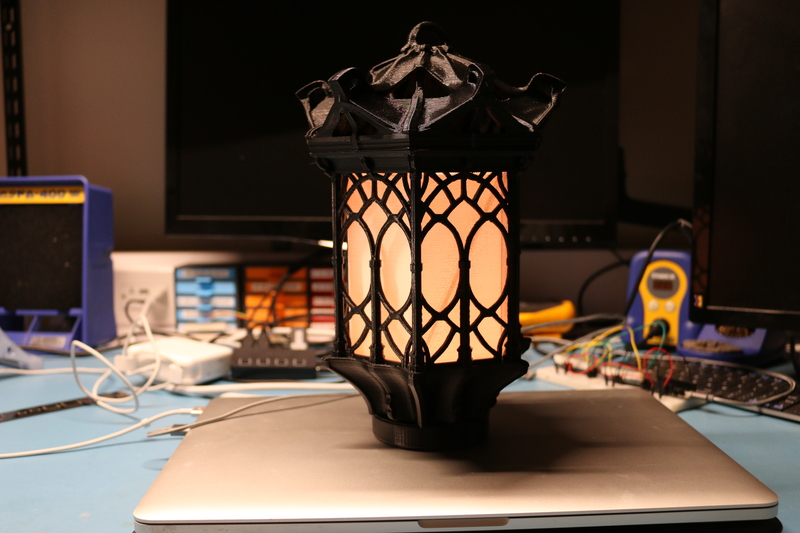 I built my lamp in a modular fashion so it would be easier to change if I have a different job or workspace in the future and don’t want to rebuild this lamp from scratch. 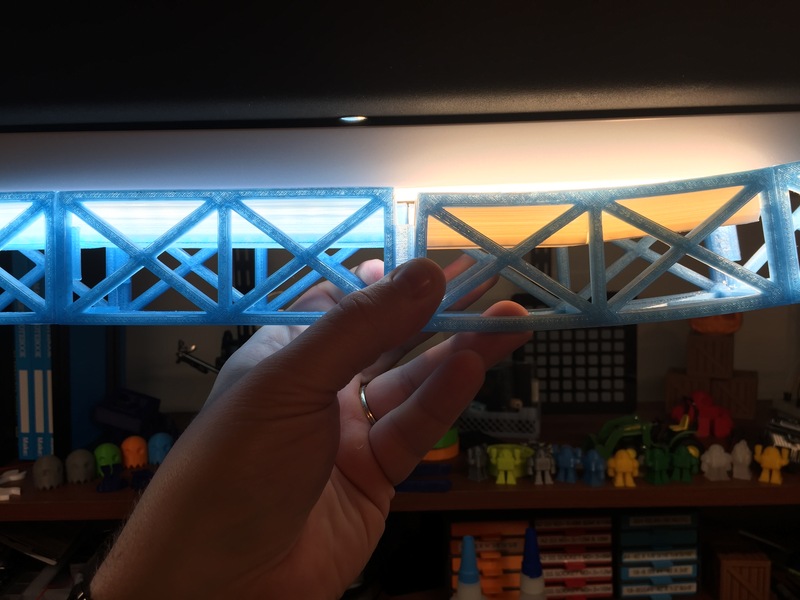 With a completed section of bridge (superstructure + lamp shade/diffuser) in hand I would test fit it with the next piece of the bridge. This meant testing to make sure the tabs locked well into each other — usually filing meant flattening any edges/corners that were rounded and likely squaring up the clips a bit to fit tightly. Squaring up the clips meant filing out a bit of the underside the tab which was triangular in profile to better mate with the square edge of the adjoining piece of superstructure. 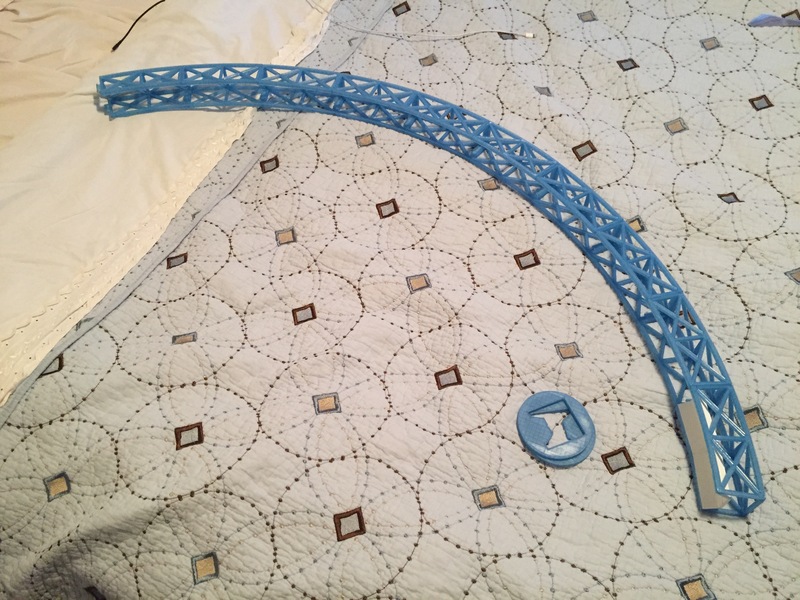 The photo below shows one of the 90 degree assembled sections. In order to fish the LED strip through the channel I soldered a long piece of wire (longer than the assembled section) to one of the pads on the LED strip and then used electrical tape to further secure the wire to the LED strip and protect the pad — as they are really easy to pull off — and likely after this you’ll want to sacrifice/cut off that first LED. I then pushed the wire through the channel. Now for the dancing…. Getting the LED strip through the channels was a time consuming and sometimes quite frustrating ordeal. I would push the strip in from one side and GENTLY pull the wire from the other side. This is where the pains taken to keep things aligned will hopefully pay off for you. Keep feeling where things get stuck (usually an LED on a junction between sections). Usually I could press the thin diffuser cover a bit and push or pull to get it past that catch point and keep feeding the LED strip into the assembled section. This dance will take a fair amount of time and patience — but the result is worth the trouble. If you plan to make sure bridge lamp in modular sections as I did you’ll want to use the diffuser section ‘A’ with wire cutouts (shown below) for any place where you want to mate two sections of lamp. These sections have a place for wires to get out of the channel and allow for modular wire connectors — I used JST connectors — to be placed inside of the bridge superstructure. In the post on electronics I’ll talk about the JST connections etc. 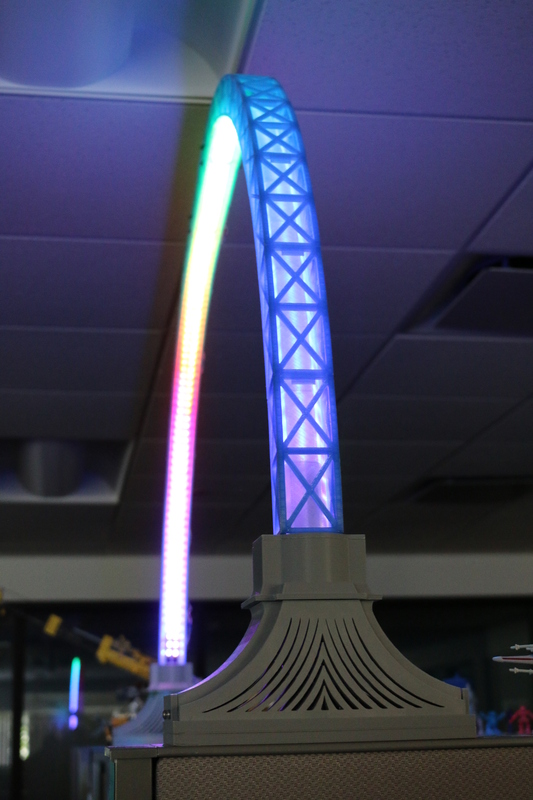 You can navigate back to the Enhanced LED Bridge Lamp Summary here. As I worked out the details of my version of the LED Bridge Lamp by my friend Janis (Opossums) Jakaitis, one of the things I wanted to tweak was the base. ** The location in my cubicle at work where I wanted to to install this light has two different heights — the metal wall is about 1.5 inches higher than the top of bookcase so I needed a way to compensate for that. My solution will allow you to handle any reasonable height difference you want to tackle. While my bases look very similar to Janis’ models they were created from scratch but designed to emulate the originals and add a few new features you’ll see as we walk through this post. I also eliminated a few design details like the screw holes (replaced by my magnet solution) and the transition to the cap piece. When printing the pieces called out in the print details section above I printed all my pieces with a brim to help reduce or eliminate warping. 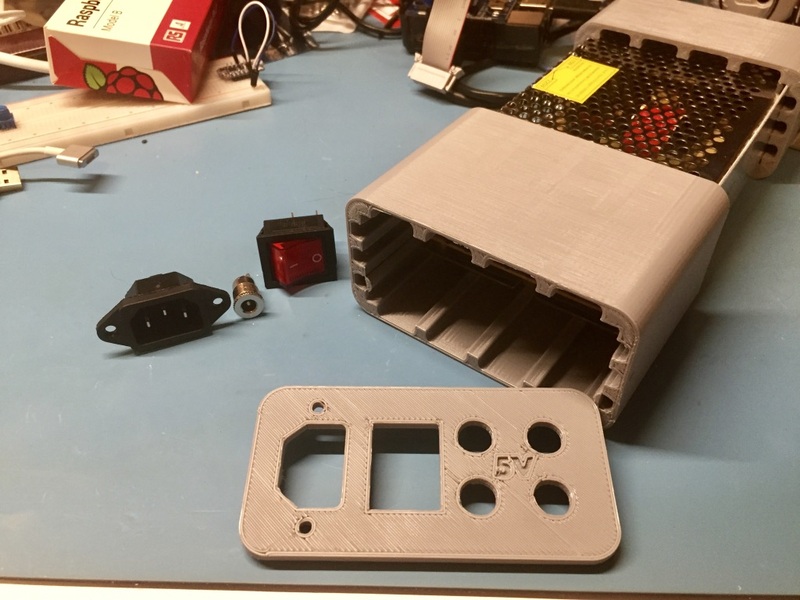 The elements of an assembled base (1 regular side, 1 side with power outlet hole, center, cap, riser and base plate) are designed to fit inside/on top of this electronics tray. The tray is designed to also secure an Adafruit 1/2 size Perma-Proto board which is what I used to house the electronics that control this project. 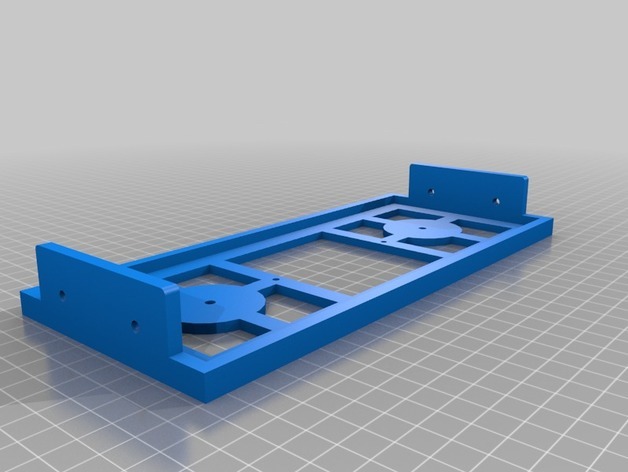 (More details on that in an upcoming post) The tray also provides supports for the height spacer which keeps the magnets in the proper location. NOTE: You may want to print the tray 1-2% larger in the X and Y dimensions. Otherwise you may find yourself using a fixed belt sander to thin things out a bit. Guess how I know that? 😉 And my machine is really pretty well dialed in. The height spacers below were designed to align themselves under the electronics tray via the little standoffs you can see in the image below. The height spacer also keeps the magnets secured as the base gets moved around. The height spacer can be extruded to make it as tall or short as you want. The spacer above is the minimum height as it is the same thickness as the 90lb strength magnets. For taller spacers I also designed a filler block to make up the space between the magnet and the bottom of the electronics tray. The model can also be scaled in the Z axis to adjust the height. The electronics tray also makes a helpful aligner as you glue up the base pieces. I used some small clamps to hold the sides and center together as the glue dries — only takes about 1 minute to dry enough. NOTE: Be careful that you don’t glue your base into the electronics tray. In the lower half of the picture above you’ll see the baseplate sitting upside down in the height riser so that I could glue the blue clips in place. Once the clips are secure I flipped the plate over and glued it on top of the height riser block. NOTE: The base plate on one side does NOT require the clips. Be sure to test fit your bridge section and the two plates and file as needed to make sure you have a good snug fit. Filing usually meant squaring up the underside of the clip to make sure it squarely engages with the bridge superstructure section. You can insert M3 button head screws into the holes shown below to secure the top section of the base to the electronics tray. The screws tap themselves into the plastic and hold well. Examining the underside of an assembled base section you can see how well the magnets fit. NOTE: Use two nuts on top of the screw securing each magnet so they don’t get loose. I installed the electronics into the taller of the bases and drilled a small hole to allow the USB cable to pass through so I could flash new firmware onto the micro controller after the lamp was installed. If you have any questions about building the base, please let me know in the comments section below. The superstructure of the LED Bridge Lamp is one of its most prominent features. 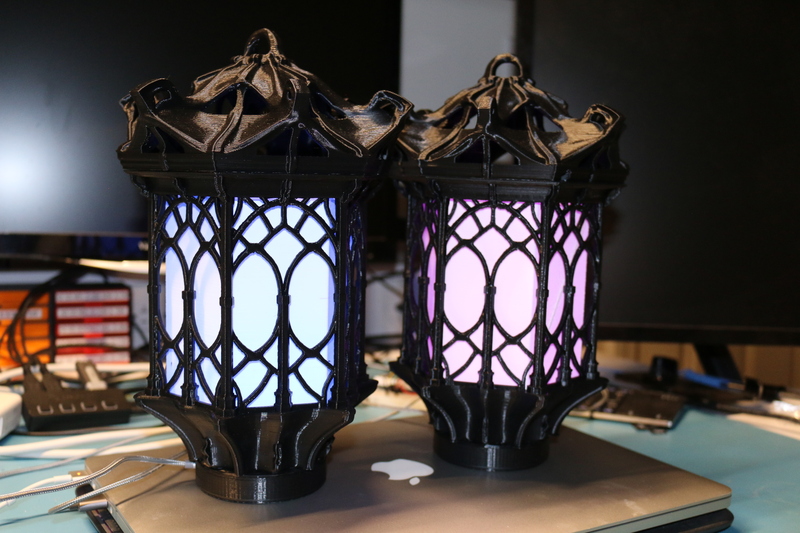 I printed mine using Polymaker Polylite Translucent Blue filament. I started off by printing the standard set of flat printing models from Janis’ universal segment version of the lamp here. I also printed a set of the aligner/clamping rings that aid in assembly. 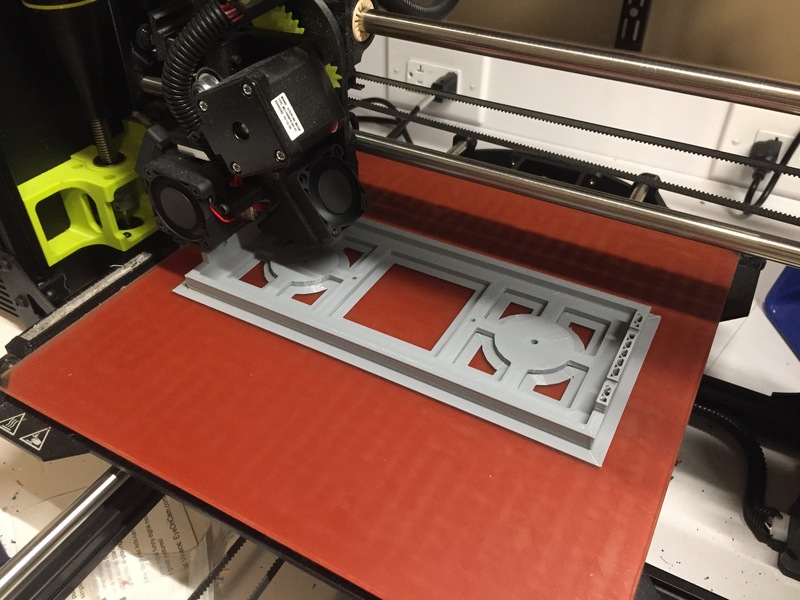 When I started working on this project it was the middle of winter and I think a combination of room temp and small surface areas caused some issues with pieces warping and even popping off the heated bed plate. 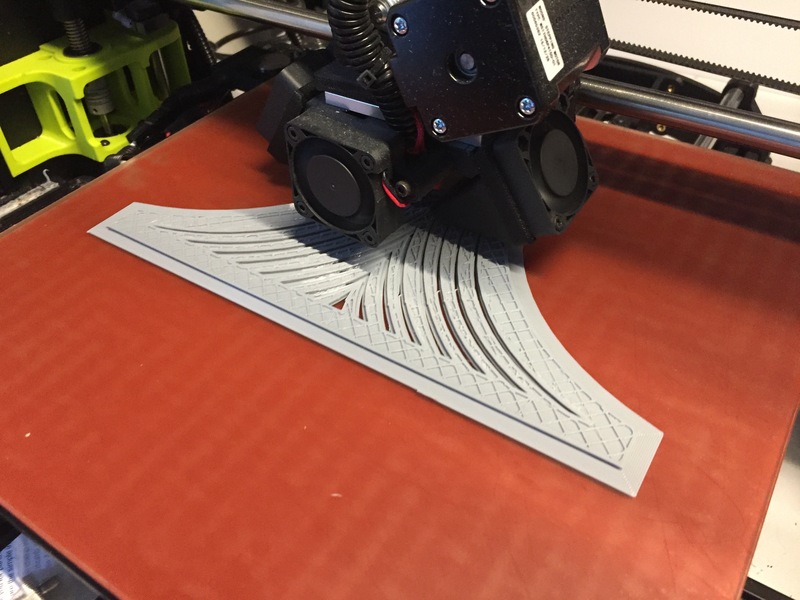 To remedy this I started printing the superstructure sections with a brim. Around this time I also started to eliminate the printing of the original shade. In Cura I broke the model (which was a group of pieces) into its pieces and would delete the shade. This also allowed me to fit a few more pieces on the build plate. 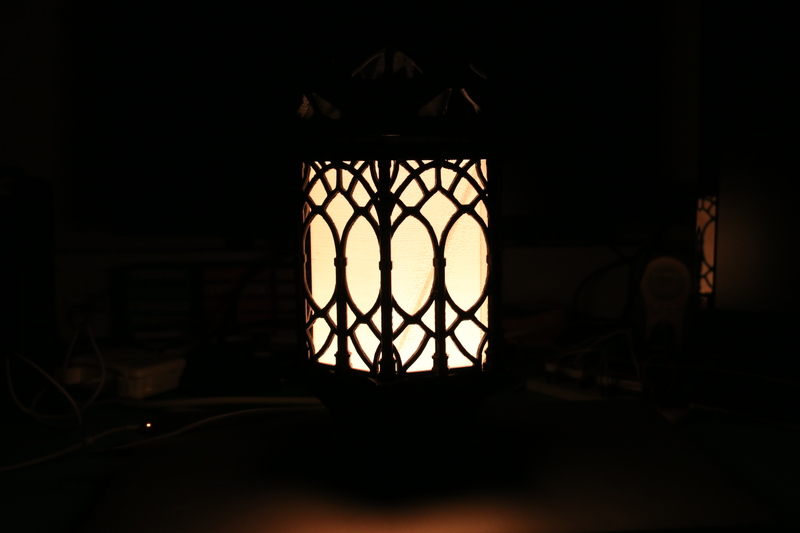 I decided to make my own lamp shade/diffuser which I will cover in another post. I would clean up the prints with an X-acto knife and square mill file. Each section didn’t need much cleanup. Most of the work was spent testing the tabs on each section and making sure it fit securely onto another section. The focus usually was making sure the corners were flat and that the tabs squarely locked over the end of the next section by filing the underside of the tab. Next I would dry fit the pieces in the assembly rings. Once dry fit I would slide the top of the superstructure out a bit, apply a drop or two of LocTite 401 to the assembly tabs and slide the piece back into place. I would then remove the lampshade, run a bead of glue down the retaining lip on each side the superstructure and then slide the shade back in so the glue could set. After a minute or so the alignment rings could be removed and you can move on to the next section. By the time the next piece was filed and ready the last one was dry so I only needed one set of the rings. Below you can see me testing a dry fitted piece against a completed straight section of bridge. The above sample pieces have a translucent blue light shade from the original model, but as you’ll see in the upcoming post on the shades I went with an remix that I think you may also like. As things got up and running I had a little production line going — churning out bridge sections and and assembling as I could find the time. 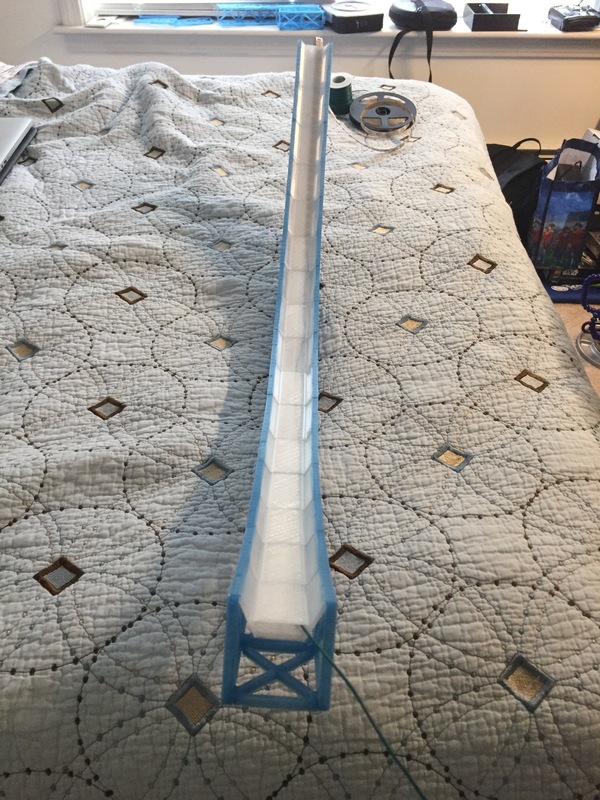 I wanted to get a feel for how big the lamp would be, beyond the calculated dimensions so I assembled 2/3 of an arc — just the assembled bridge sections without the shades. It was fun to see the project coming together. The above assembly I put to the side in the spare bedroom where I have my 3D printer etc. It was near a window and a baseboard radiator. Given that the PLA is extruded at 210C and at most my sealed baseboard radiator is putting out 100C I wasn’t worried about melting. 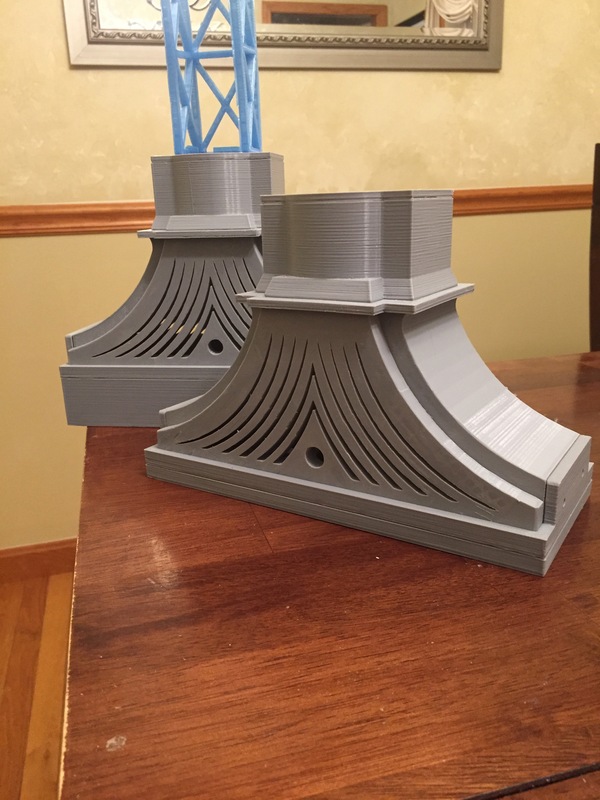 After a few weeks I thought one of my young kids got to it, but as it turned out the PLA was softened by the sun and/or radiator and 9 assembled sections of the bridge lamp were warped/bent beyond what I was willing to accept so that was a big set back. After another 40 hours or so of printing I eventually replaced all those pieces and was careful to keep the lamp sections away from even that modest source of heat. 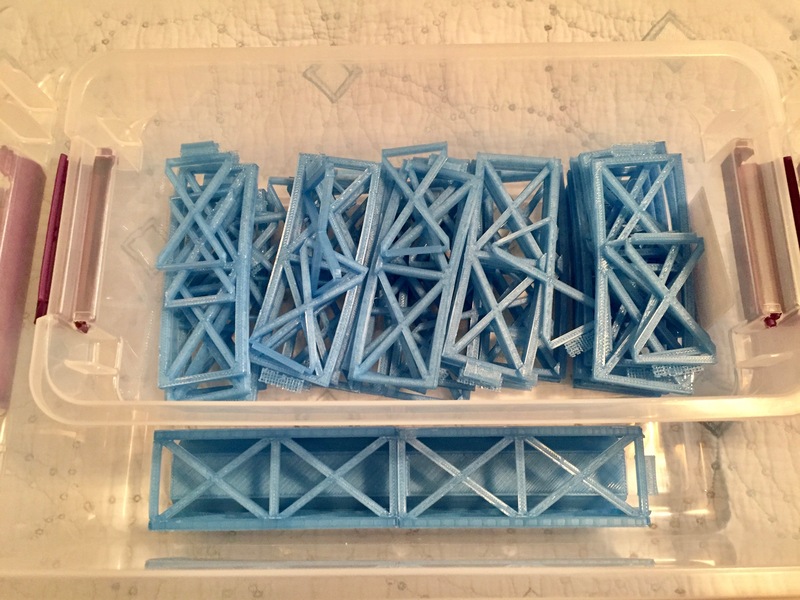 I started to stockpile the assembled bridge superstructure sections as I worked on the shades which will be covered in another post. 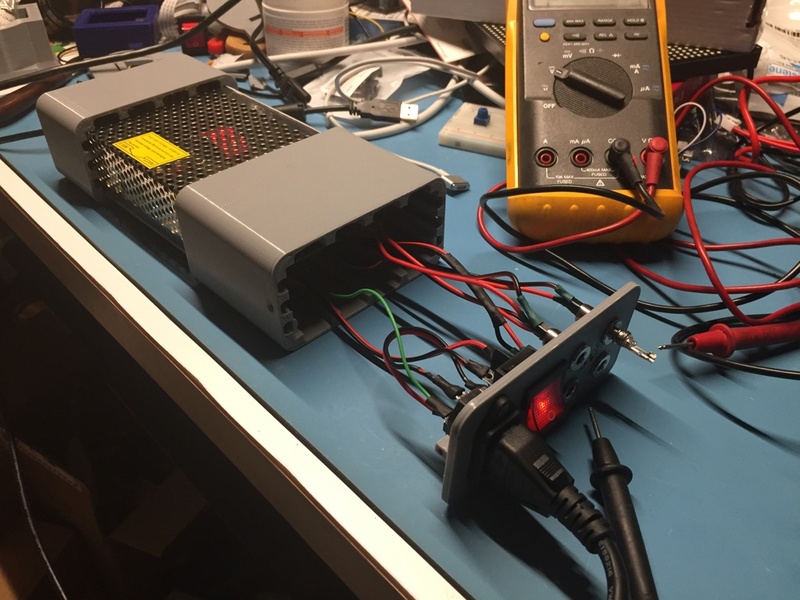 Next up in my series on building my own interpretation of Janis’ LED Bridge Lamp I wanted to share out my re-mix of his power supply cover/case. 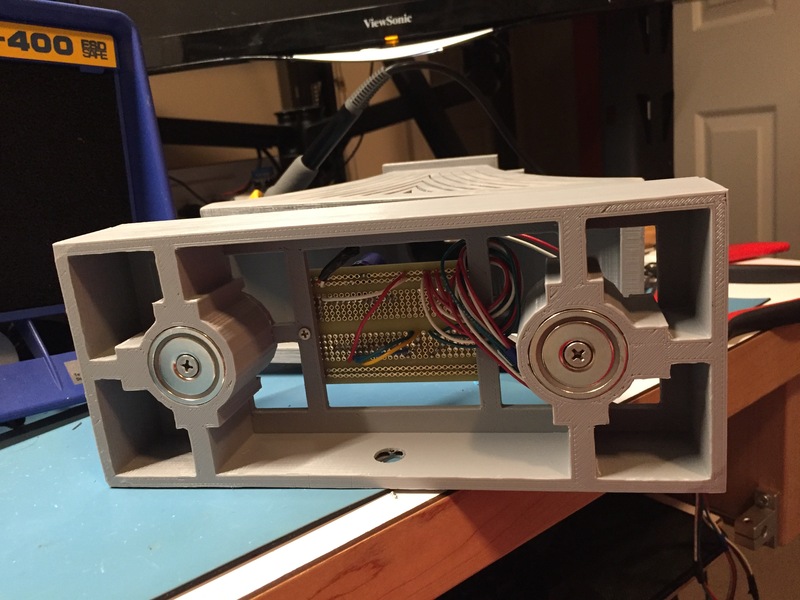 In the original case, from the photos and models on Thingiverse it looked like Janis cut off the front of the case to attach the various plugs and switches. I also couldn’t find the exact same switch and plug so I decided to re-mix my over version. 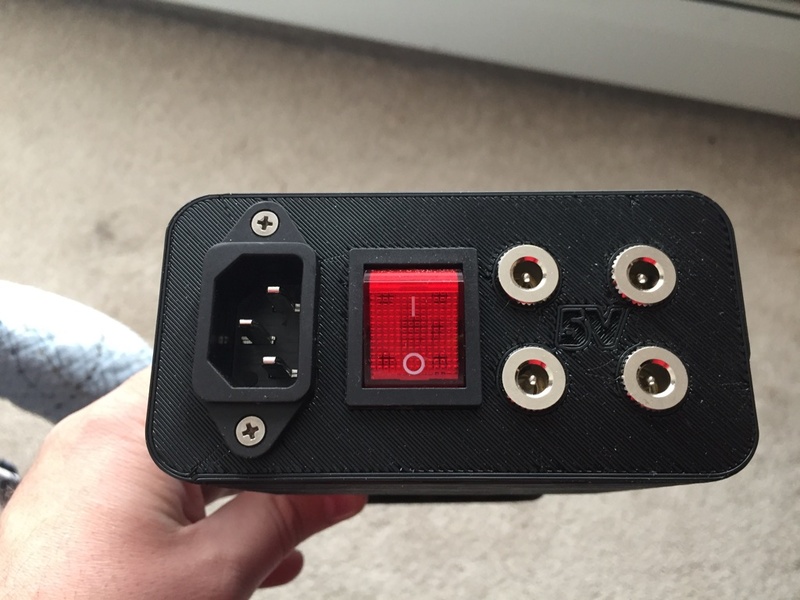 Test print this sample to make sure it properly fits around your power supply. If it doesn’t fit you can scale and re-print until you get it right. I started off with Janis’ solid bottom of the PSU cover. 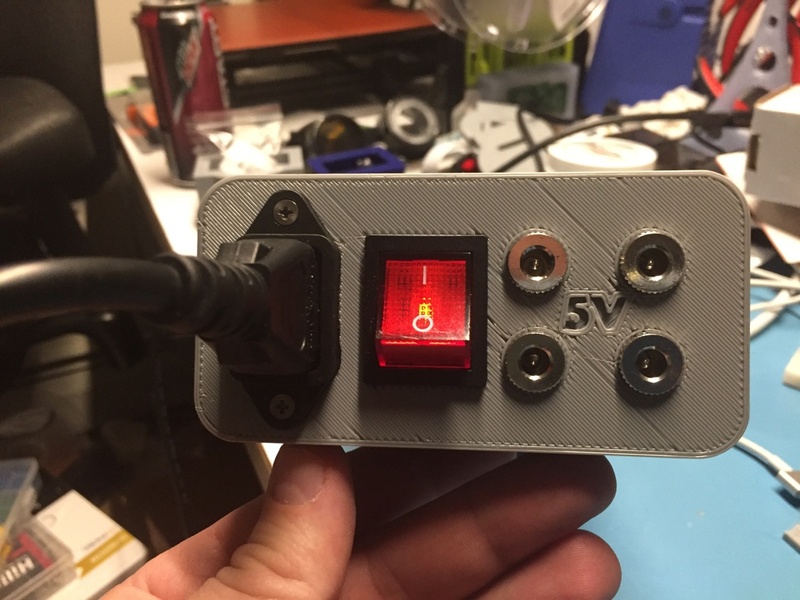 I bought the same 5V/20A power supply from AliExpress and printed the bottom. It fit great. 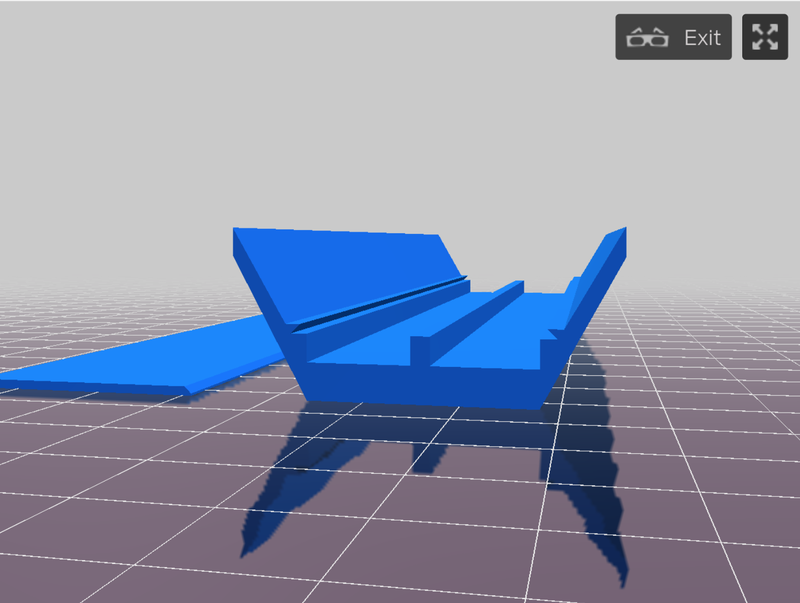 I then imported his model into SketchUp and copied the outline/profile of his case. I extruded it 2mm and printed it as a test sample. 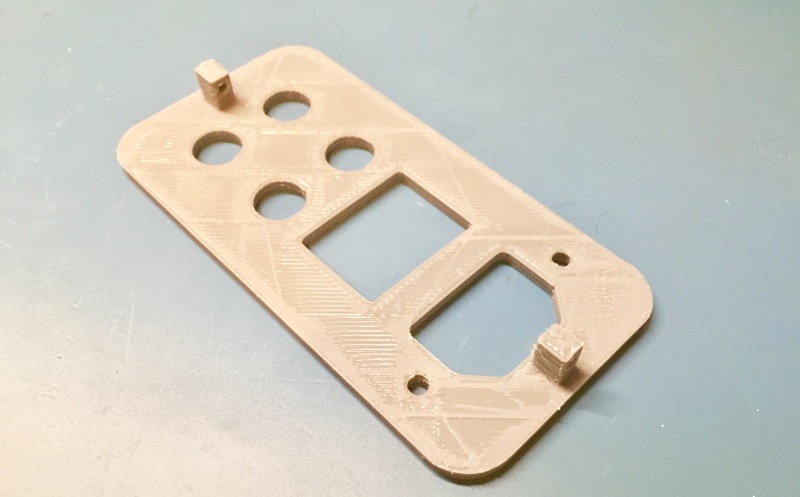 This is useful for folks trying to scale the case up or down to get that tight friction fit — change your settings then print that test piece until you get the size you want — then use the same settings for the actual parts. 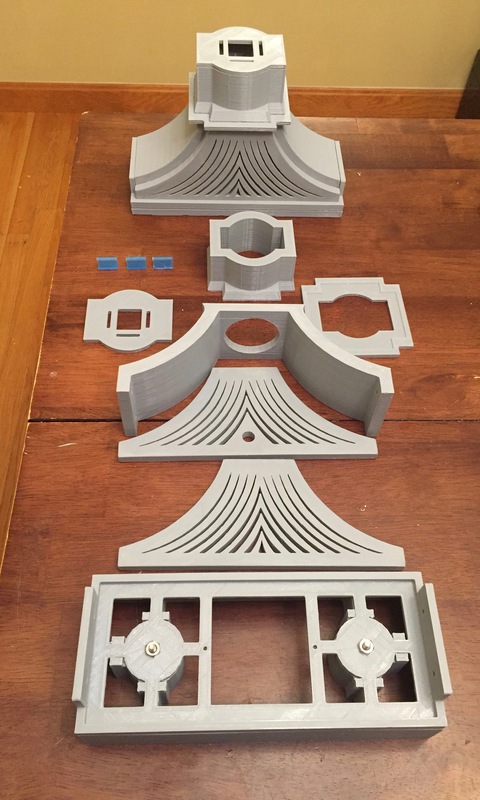 Printed parts ready to go. I extruded that test print model to be 80mm tall — this forms the majority of the cover. I also added a depth stop at 40mm and a carefully laid out two holes to receive the screws that secure the custom faceplate. 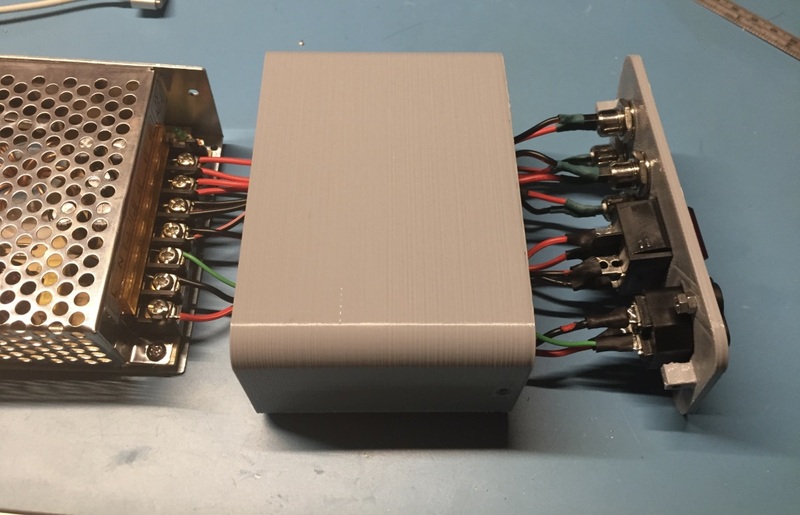 This long extruded part with a stop gives me a positive depth stop and a reasonable amount of space in the enclosure to house all the wires, connections and backs of the connectors. The face of the above cover also has a nice recessed ‘5V’ to let potential users know what voltage we are outputting with this unit. The 110V/220V power inlet is secured with two M3 x 10mm screws and 2 nuts on each screw. The power button snaps into place with tabs. The metal barrel jacks are secured via a lock washer and nut that threads onto the barrel/body of the outlet. Make sure the PSU unit’s slide switch is set to the 110V or 220V input voltage you plan to provide. All of the output port wires were 6″ long 22 gauge wire. 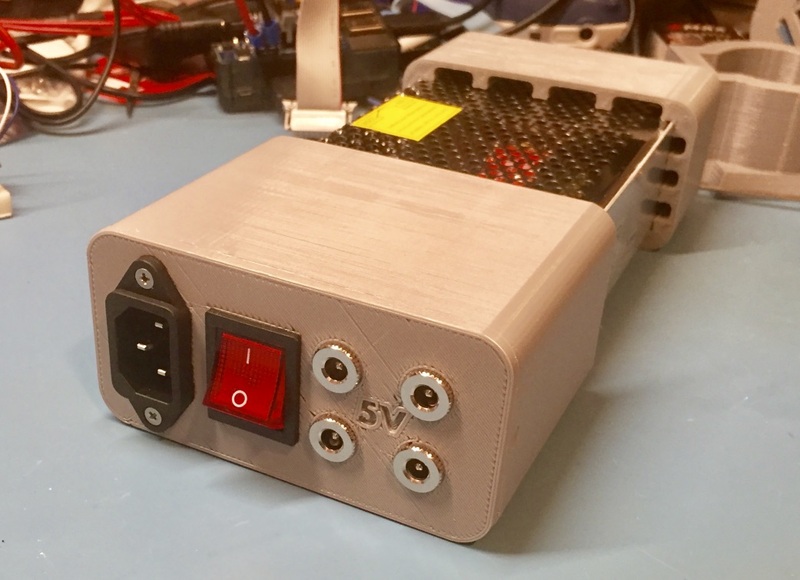 The power inlet hot and neutral are routed through the power switch and the ground goes from the inlet to the ground on the PSU unit. I also used heat shrink tubing on each connection to protect the connections. Route the wires through the extruded cover and attach them to the proper terminals, then slide the cover down until you hit the depth stop. Now test your PSU using a multi-meter. I inserted an appropriately sized barrel top plug without its protective jacket to make it easier to attach the multi-meter probes. The output was exactly what I expected — a tiny bit above 5V. If you are under 5V you can adjust the output using a trim potentiometer on the PSU board to the right of the screw terminals. With the testing complete it was time to gently bend the wires and secure the faceplate with two M3 x 6mm machine screws. 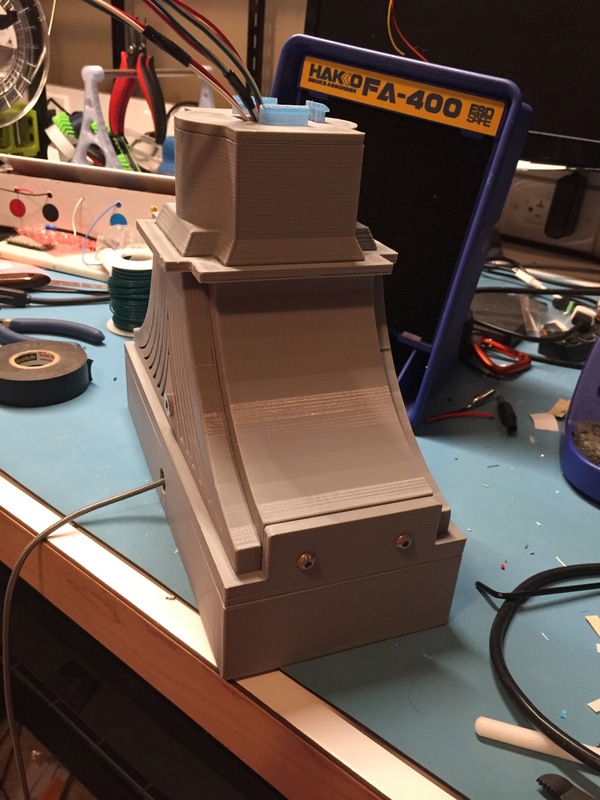 With the PSU assembled and powered on it’s time to get back to working on the bridge lamp itself. The Gray printed PSU cover from earlier in this post will live in my cubicle at work and power the main LED Bridge lamp I am making, but the secondary (smaller) LED bridge lamp I am making for home would look better in black PLA — as I think that will blend better with my black metal MakerBench. 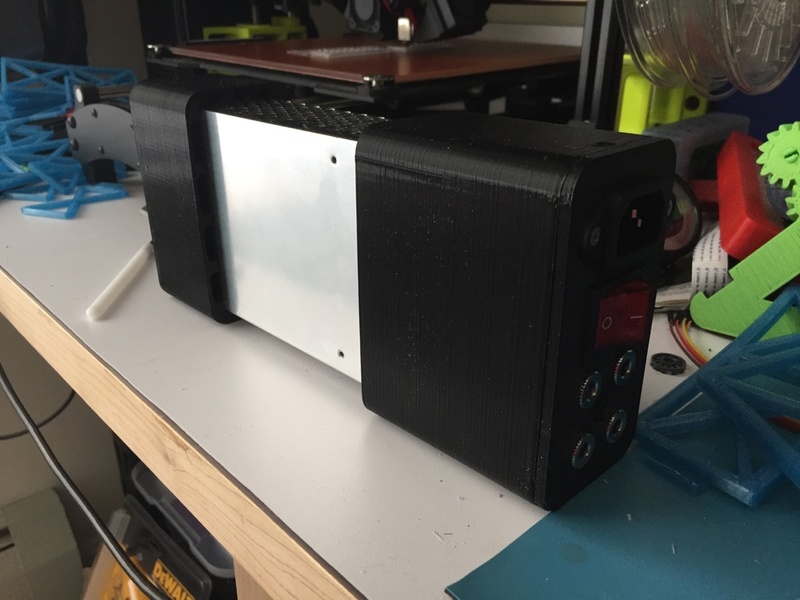 If you’d like to make one of these PSU covers based on my remix you can find the models on Thingiverse here. If you build your own version of this project, please leave a comment or send me a note. My day job is working as a software developer for Redhat which is the world’s largest Open-Source software company. 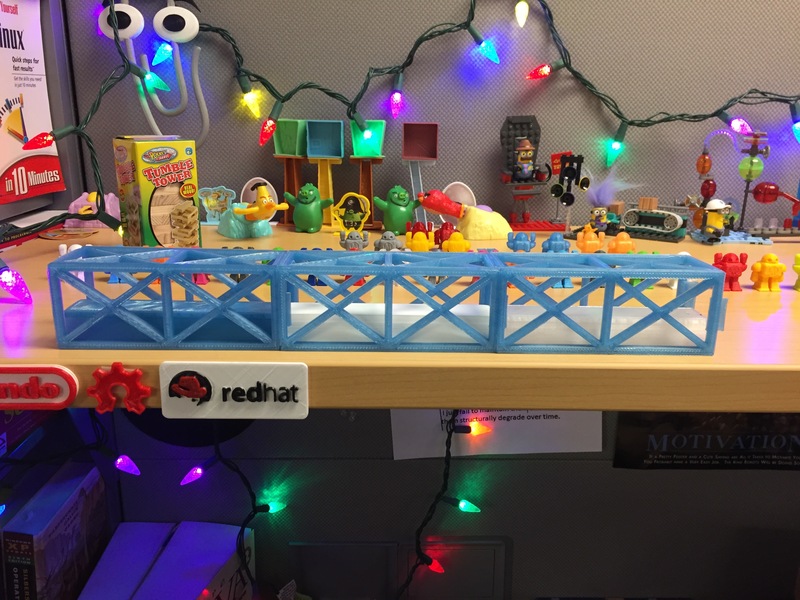 It’s a fun place to work with a vibrant culture — kinda like a geek summer camp at times — as many of us like to decorate our cubes with various nerdy projects, toys, artwork etc. I love to design and build things — check out my long running woodworking blog here for some of my designs and work with wood. As an engineer I also love to tinker with tech. 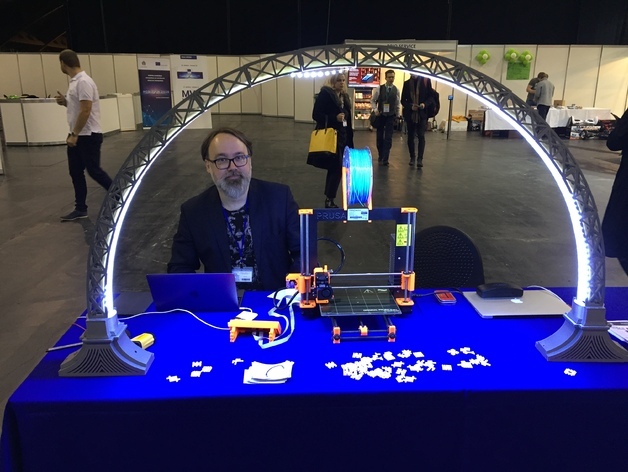 Early in 2016 I bought a Lulzbot TAZ6 for home and have been having fun getting involved in the Open-Source 3D printing, electronics and maker world. 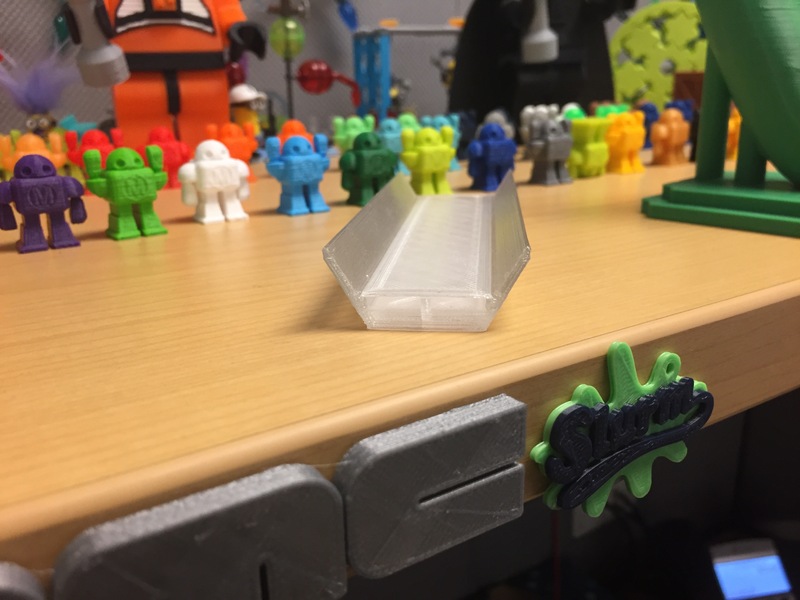 I also setup and run a 3D printing lab at work in the office. A few months ago I designed and 3D printed a small Redhat logo which you can find on Thingiverse here. Since then I have embarked on a more audacious building campaign to build my own interpretation of Janis’ LED Bridge Lamp. 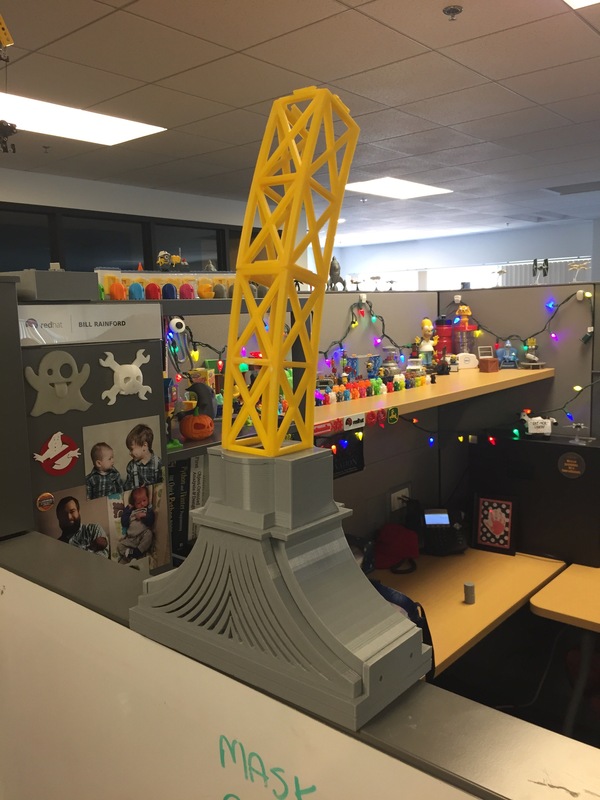 I want my bridge lamp to span from one wall of my cube to my bookcase and incorporate some fun additions that I will reveal in upcoming posts. I tripled the size of my original Redhat Shadowman logo in the x and y dimensions and printed the background in clear Colorfabb nGen filament. The letters, fedora and case are in black and red nGen filament. Every 2.01mm of z-axis height I would pause the print, swap, purge and resume the print which resulted in a nice 3 color print for the logo. 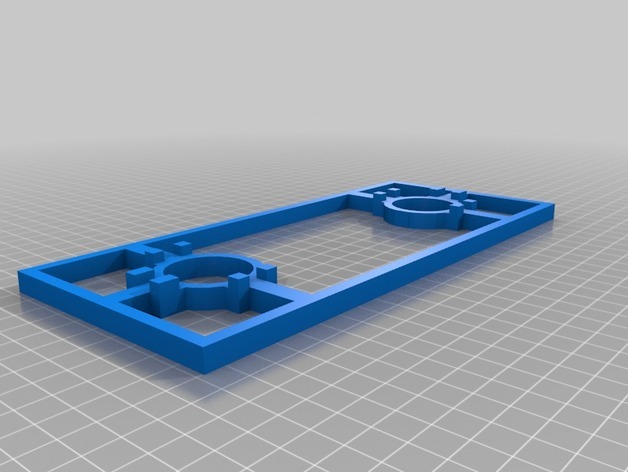 I designed the case so that it can be printed without any supports. Use a pair of nippers to remove the small bit of supports I added to the model (see photo above) which will allow you to easily access the USB port on the Adafruit Trinket which controls the LED strip. The 3 color sign has 4 holes that snap nicely onto posts located on the inside of the bezel of the case. I don’t know why so many designers make the holes and posts the exact same size — it makes for unnecessary fussing with the print. I made my posts a few tenths of a millimeter narrower so I could snap on the logo without any fussing. The back of the case also has a nice negative image of the Redhat Shadowman logo. The back also snaps nicely into the front section for clean lines and no need for additional hardware. nGen has enough flex in it that you can bend the case if you need to open it again in the future. 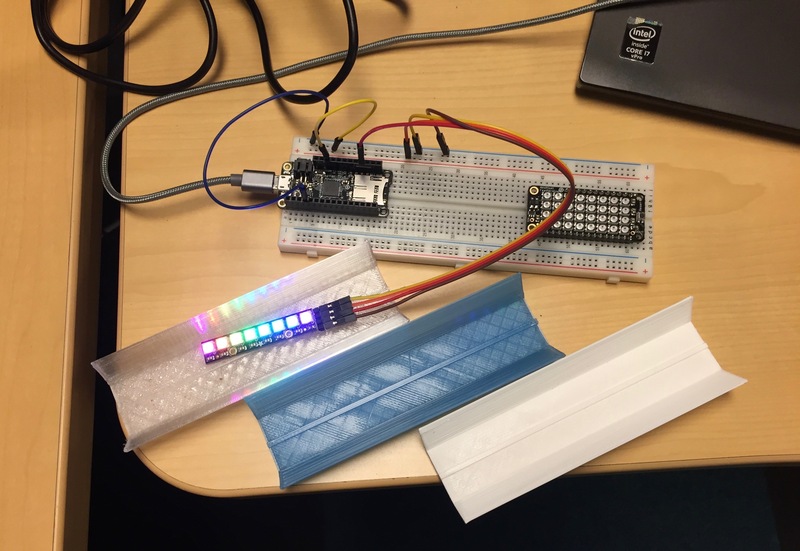 Basically you are driving 10 NeoPixel RGB leds via an Adafruit Trinket 5V tiny arduino. I included the JST connection below in case I ever want to re-purpose bits from this project and because these LEDs were from the start of a new roll, so I figured I might as well use the cabling it came with in this case. I used some 3M double sided tape to keep the wires secured and some M3 x 6mm screws to keep the Trinket mounted to the back of the case. The LED strip comes with some adhesive tape on the back to keep the strip in place. I find that tape on the strip to be a little fussy so make sure you clean/alcohol the inside of the case and firmly press/rub the strip to make sure it is well adhered. The animations for this little prototype sign are pretty straight forward. The system comes up, does a wipe to make the sign glow white. After ~30 seconds it wipes to dark and then cuts over to 30 seconds of a pleasing rainbow animation. Then the loop repeats over and over again. You can find the source code for this project on my GitHub account here. The animations could be easily augmented. You can create your own or re-use some of the animations from my earlier Adafruit Feather BLE + NeoPixel ring lamp. Note that he regulator on a Trinket is only 500 milliamps so I make sure to limit the maximum brightness of the LED strip to make sure I don’t overload the system when the background is set to white. 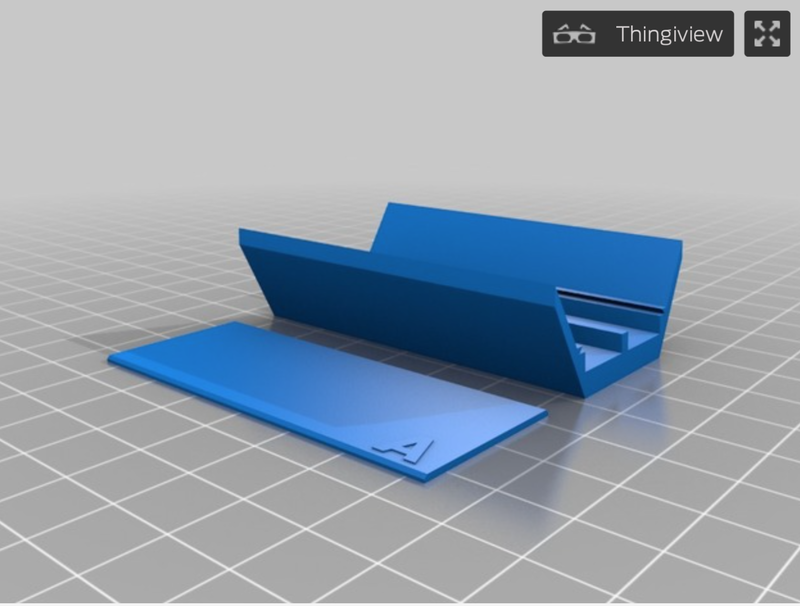 If you’d like to download the STL models for the Redhat Logo sign and case you can find them on Thingiverse here. If you build your own version of this project, I’d love to hear about it via a comment or contact page note. The workshop is my happy place — I go there to create. One of my favorite things to do out in my woodworking shop is to build cabinets, organizers and jigs to make it easier to work or accomplish a given task. I’ve been applying that to my recent work with 3D printing and electronics hardware hacking. By training I am a software engineer and a preservation carpenter — yep the is an unusual mix to some — but to me I use the same part of my brain to envision a large software application and break it down into manageable pieces of code and then write them that I use to envision a chair and break it down into all the steps and pieces that start at a tree and result in a chair. After getting some more work time at the Maker Workbench that I recently completed I realized that my hand tool storage was lacking. I was storing my pliers, strippers, nippers and similar tools in the holes on the sides of the metal racks that support my workbench. For tools that only get used infrequently the holes on the support posts of my maker workbench do a good job at keeping them off the desk, but are a pain to get in and out of for frequently used tools. 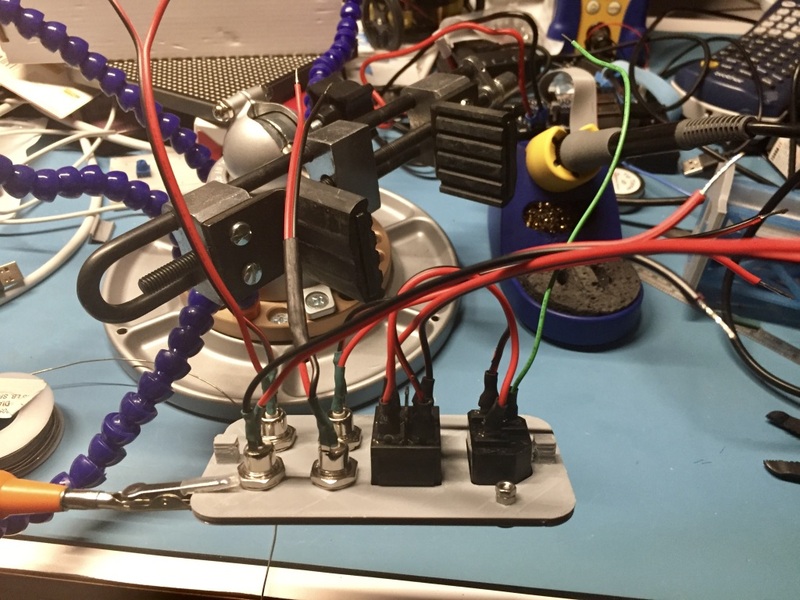 It seemed like a great idea — I can see the tools, they are off the workbench and reasonably accessible, but for common operations I felt I was wasting too much time and energy getting them in and out of those holes — as sometimes they would catch a bit on the way out. After thinking about some of the optimizations I made out in my woodworking shop and watching videos like some of Adam Savage’s shop tours, behind the scenes and shop projects builds from tested.com and this video in particular which made the case for not using drawers I wanted to come up with something efficient to organize the tools I used most often on the bench. The rack is about 6″ tall, the base is about 6″ wide and the rods are about 12″ long. I bought a 36″ long piece of O1 Tool Steel Round Rod, Polished Finish, Precision Ground, Annealed, Metric 10mm from Amazon here. I cut the rod on my abrasive cutoff saw and ground off any burs and chamfered the cut ends a bit so I would be sure they’d seat nicely in the 3D printed ends. 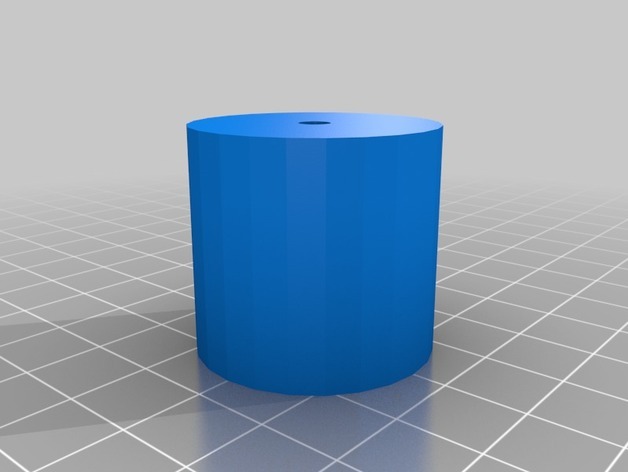 I then made what I felt was a reasonable sized 10mm end cap in SketchUp and printed it out. It was a tiny bit tight so I measured the rod and the print and adjusted things a bit and tried printing at 102, 105 and 108%. 105% was the sweet spot and gave me a nice tight fit. 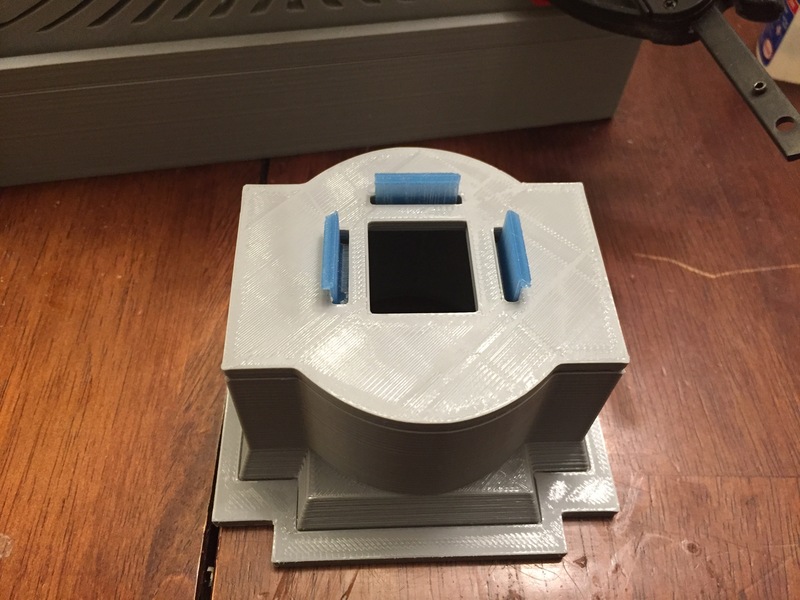 I also made a variant of the end cap to include a #4-40 machine screw to see if that would keep the cap on there even tighter but felt it was negligibly better in this case and recommend you print 1 or more of these caps to dial in your printer an get a real nice fit. If you still find the cap is loose you can epoxy it into place. Printing each side of the tool rack. 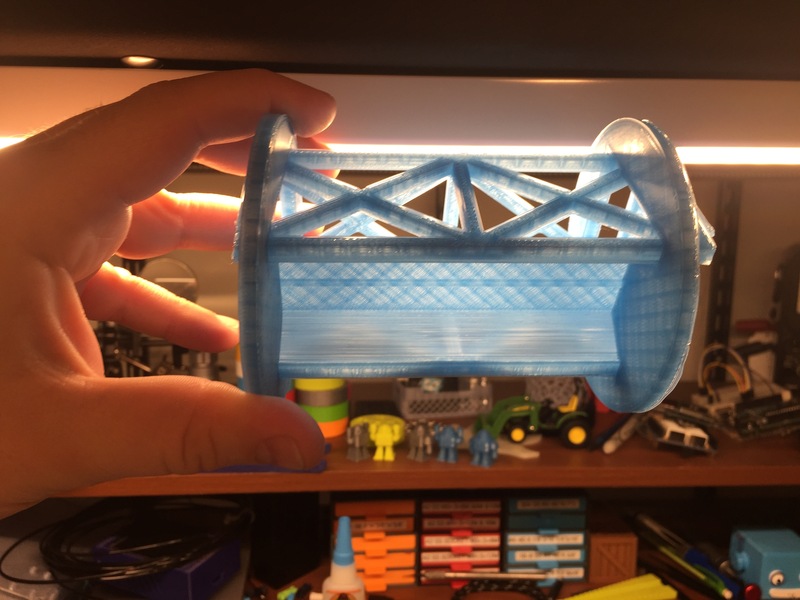 Printed with a brim to try and minimize any warping. With the printer dialed in and the cap in hand it was time to print the sides. Rather than waste material and to increase the aesthetics of the rack I added a series of holes to the model to give it a more pleasing and modern look. (Left) Side with brim still attached. (Right) Cleaned up piece ready to go. 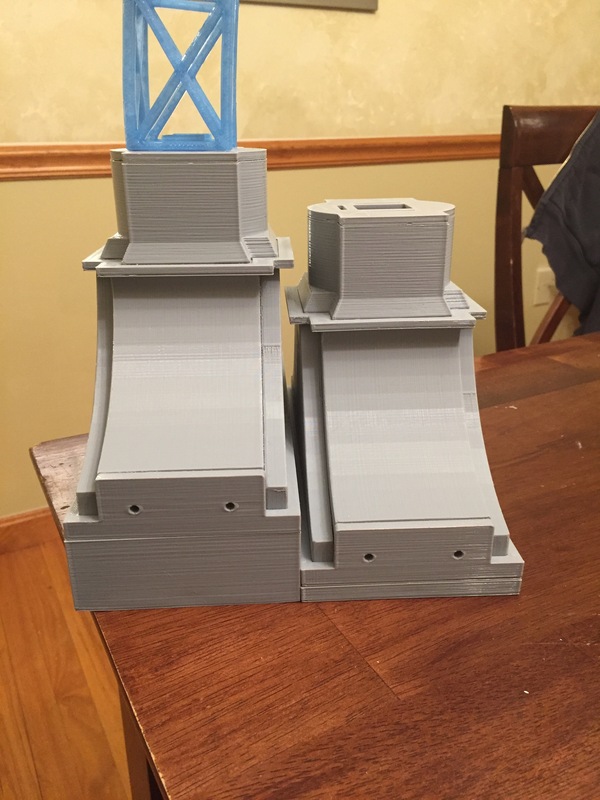 I printed the sides one at a time with a brim to try and minimize any warping. View from the side of the completed rack. The cleanup was easy with an X-acto knife and the assembly was simply inserting the rods into the printed end pieces and start using the rack. The above described rod is a bit on the expensive side, costing about $15 but the ground and polished look is what I wanted and it adds a pretty good amount of weight to the tool rack and I’ve found it stays right where I leave it on the bench. It works well with all the small and medium size pliers shown below and can also accommodate some of my larger and specialty channel-locks and similar hand tools. If you are on a budget, simple mild steel rod from a hardware store or even a wooden dowel can be used. 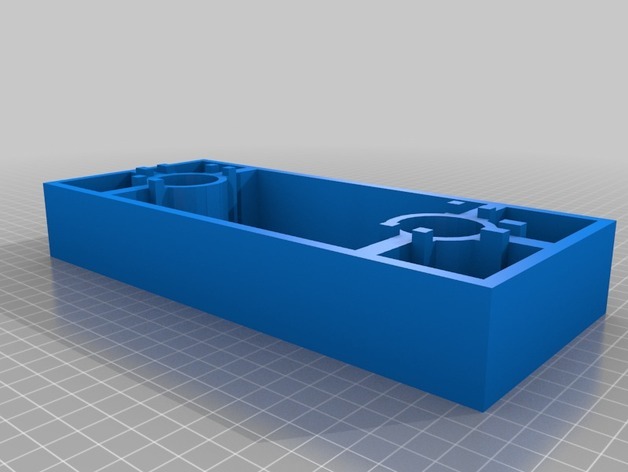 I’ve shared out the plans and SketchUp files for the end caps and rack sides (both solid sides and the sides with the circular holes) up on Thingiverse.com here. If you make or remix this project, please share some pics or notes in the comments below. After creating my own model and printing it the next challenge I wanted to try out was printing in to colors of filament. I don’t have a flexy dual extruder yet (though I do want one) I wanted to take a shot at designing something that would work well being printed with two colors at different layers, meaning I could pause the print, swap filaments, purge and then resume the print. I was inspired by some of the stickers and images I’ve seen online for Reverse Engineers and decided to make a fun little sign for my maker bench. I designed this model in SketchUp and exported it as an *.stl file. It can easily scaled to a larger size. I wanted to minimize the amount of warping and among of filament used. If you want a thicker base just scale up in the Z axis. 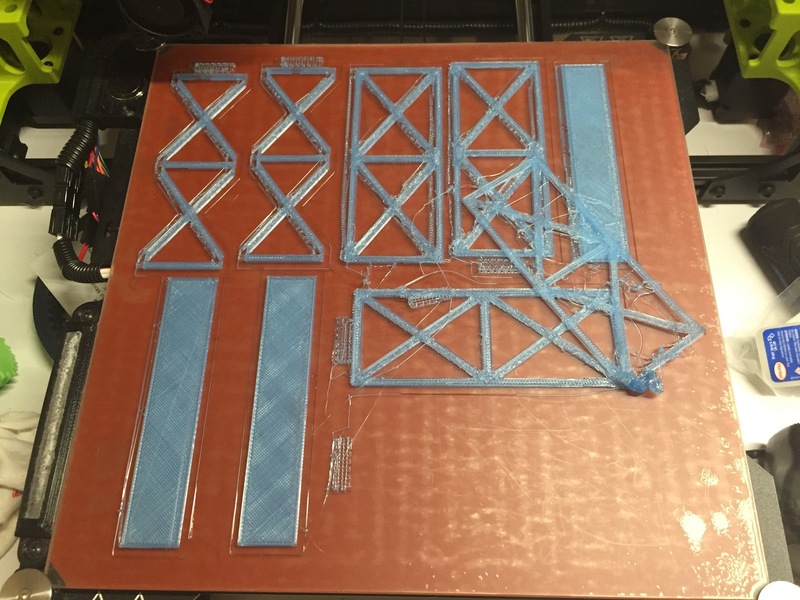 Printed scaled 2.0 in X and Y axes, and at 3.0 in the Z axis. This gives me something a little bigger than a business card. The trick was sitting there watching the print and pausing at just the right time to swap the filament. This meant finding the first layer wherein the background is complete and we are about to start printing the text which is proud of that surface. I looked at the layer view in Cura and could figure out when I wanted to do that filament swap. Worked great on the first print. At some point I want to look at hacking the GCode or similar means to automate the pause, but I wanted to do it as fast as possible so the print didn’t cool down too much as I didn’t want any unnecessary adhesion issues. I’m very happy with how this print came out and look forward to trying this technique with other models. If you make one, please leave a comment or link to your make photo. 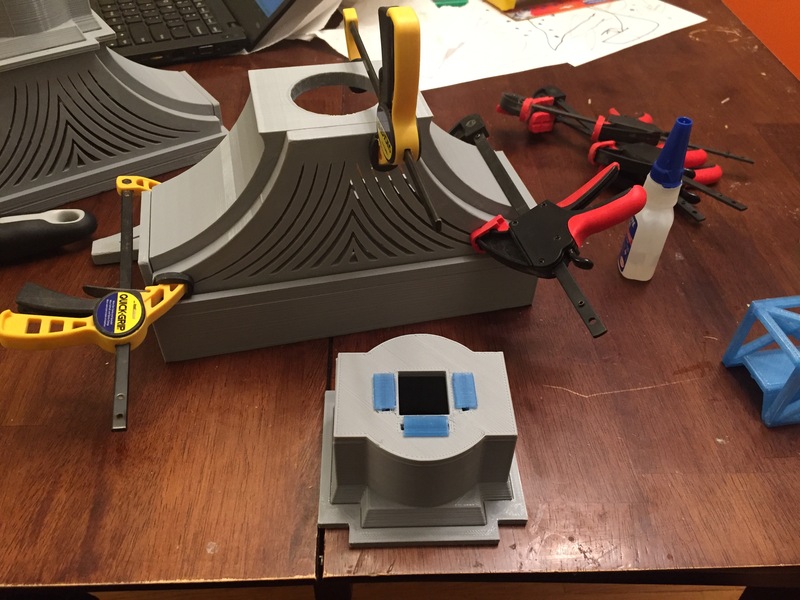 Back in May I ordered a Lulzbot Taz6 about a week or so after it came out — I had been waiting and saving for one for quite a while. I got to try one at the Red Hat Tower, the corporate HQ down in Raleigh NC and was quickly hooked. (I work for Red Hat, but at their engineering HQ which is is Westford MA.) Like many makers with a new 3D printer I spent a LOT of time printing random fun things from Thingiverse and similar sites. After getting a bunch of prints under my belt the next part of my 3D printing journey was to start designing some of my own stuff to print. My first custom design was this retro looking sign of my last name — Rainford. I designed the model using SketchUp and extruded my name in the ‘Lobster 2’ font. I then added a base to tie all the letters together into a one piece print. I also extruded ever other letter a bit more than its neighbor so that I could preserve the serifs in 3D and create additional shadow lines. After creating the model I used a SketchUp plugin to export the model into a *.stl file. I then loaded up Cura: Lulzbot edition to slice and print the sign. The lesson I learned from this was in creating some material to connect the dot over the ‘i’ to the rest of the word. 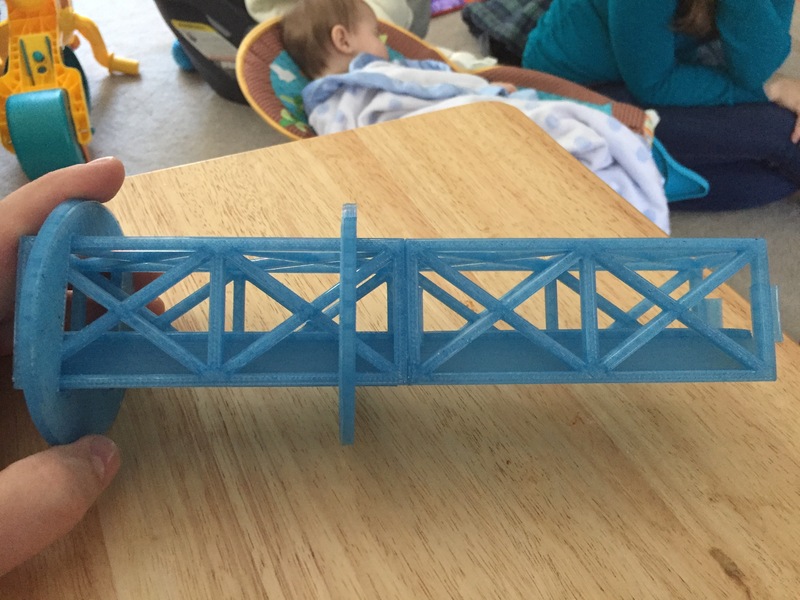 The model looked great in SketchUp but that bridge didn’t show up in the print — didn’t like how some of that solid resolved internal faces I could not see in the solid view I was looking at. I eventually learned about the Cleanup^3 and Solid Inspector^2 plugins for SketchUp that helped fix that issue and I’d also inspect via View->X-Ray. So the second print had a properly connected dot. I also now look at the layers view in Cura to make sure the paths, and the brim and supports when needed show up the way I would expect.